As everyone gathered in the kitchen to prepare for an extended family dinner, Mother took a large ham and cut off a big piece of the end and put it in another smaller pan to cook. As she prepared the two baking dishes, one of the grandchildren asked, "Grandma, why do you cut off part of the ham?" "Well, that's the way I learned how to do it from my Mom, your great grandmother." One of the Aunts says, "I thought it was because Dad liked to have his own separate piece." An Uncle says "I thought it was because it made the meat more tender." A different Aunt chimes in, "Mom said it was just the way it was always done." Curious, they decide to ask Great Grandmother the reason why the end of the ham was separated. Tail docking (amputation of the tail) has been done on dogs for hundreds of years. A variety of justifications have been offered, usually in accordance to the historical tasks of the breed. For instance, in hunting dogs, conventional wisdom said it was to prevent injury in the field from nettles, burrs or sticks; in herding or bull-baiting dogs it was thought to help avoid injury from large livestock. In truth, there are two primary historical reasons for docking. For our mastiff-based working dogs that accompanied the ancient Romans, it was believed that tail docking and tongue clipping would ward off rabies.i Obviously, this was before modern bacteriology and vaccines, when rabies was still a feared, lethal zoonotic disease that raced through cities and countrysides, infecting all mammals encountered in its path. Second, in the 17th century, pleasure/companion dogs in England were taxed, and "working" dogs, designated by docking, were not. Therefore many of the herding (farm), terrier (ratters), and some of the hunting (pointers) dogs were docked, to avoid paying the tax. Funnily, many of the English hunting dog breeds were not docked, as hunting was a pastime of wealthy landowners, and it was a sign that they could afford the tax. The dog tax was repealed in 1796, and Pasteur discovered a rabies vaccine in 1885.ii Nonetheless, tail docking continued unquestioned and unabated. Docked tails had become part of the description some dogs' breed picture, and with dogs being property, breeders and owners were allowed to physically alter animals at their discretion. However, tail docking and ear cropping began to be seriously questioned several decades ago by veterinary communities around the world. Armed with modern understandings of physiology, kinesiology, behavior and cognition, pain response and trauma in higher order vertebrate mammals, the practice came under intense scrutiny for therapeutic or prophylaxis need, and failed. When tail docking was banned in the European Union in 1998, it was rumored and readily accepted in the American pure-bred dog community that the animal rights activist community (i.e., PETA and HSUS) had somehow pushed their agenda through to curtail animal ownership rights without the knowledge or consent of the general public in Europe. In truth, the ban was proposed and endorsed by the World Veterinary Association and the World Organisation for Animal Health, which is part of the World Trade Organisation. Turns out it wasn't the animal protection groups at all-it was the professional veterinary associations! National veterinary organizations such as the Royal College of Veterinary Surgeons (UK), the Canadian Veterinary Medical Association, the Australian Veterinary Association, and yes, even the American Veterinary Association (hereafter referred to as AVMA)-just to name a few-- have all issued public position statements against tail docking. 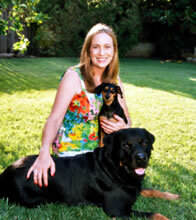 Jill Kessler Miller is an expert in the field of Dog Behavior. A certified dog trainer for over twenty-five years, she specializes in Rottweilers, mastiff-based breeds, American Pit Bull Terriers and other bully breeds.